Historyworks is creating a variety of trails based on our history research, pinning the trail stops in heritage settings using new technology, collaborating with ARM to use Bluetooth beacons to pilot geo-located walking history trails. Compared to Geocache, as a geo-located devise, the Bluetooth beacon technology allows a user much more flexibility to pin a range of information to the beacons and set them with their own geo-locational range, much closer than the GPS-enabled coordinates allow in Geocaching. We have used this technology to devise a number of geo-located history trails across Cambridge and we are growing the number of trails over this year and Helen Weinstein is involved in ongoing place-making research. Bluetooth beacons allow heritage institutions, schools and other organisations to design and deliver new interpretative narratives in their spaces or galleries by tailoring a specific section of their own website pages into a hand-held guide, (by using the bluetooth beacons to transmit specific URLs with content for a location to the visitor’s smartphone or tablet). Because the beacons are small and unobtrusive they can be popped in cabinets as a labelling system or hidden in the fabric of a room without an institution going to a great expense of involving designers and printers and purchasing fixings for new interpretation boards for rooms or labels for objects in cases. 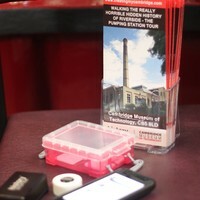 Using the beacons can also allow a heritage institution to offer a range of audio guides to be transmitted by the beacons to be tailored for different audiences, for example, a specific interpretation narrative for a student course, or to offer a family version suitable for young children to engage with an exhibition. These beacons are accessible via a free physical web app on most bluetooth enables smartphones and tablets with access to the internet.